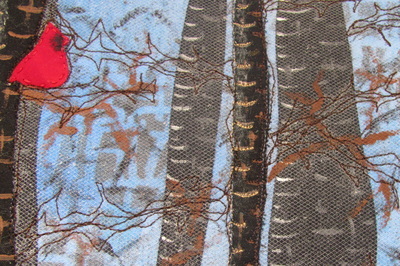 These are the textile art pieces that are available now. 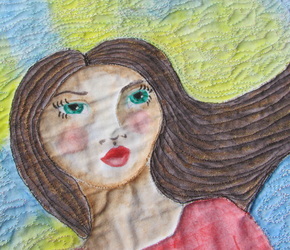 Scroll down for details and more pictures. 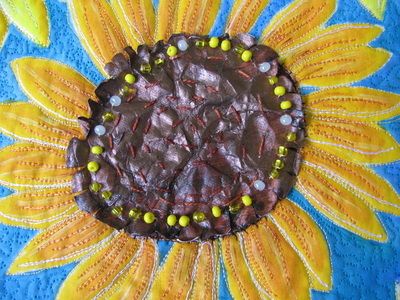 "Joyful Summer" is reminiscent of warm summer day watching the sunflowers blow in the breeze. 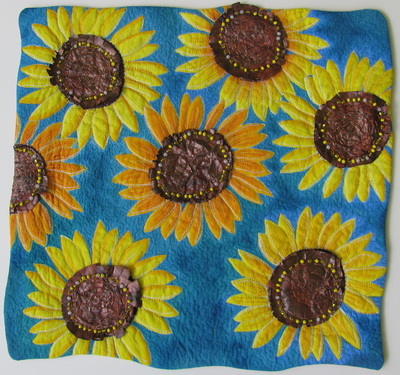 Let this wall hanging take you away to your perfect warm afternoon. It will warm up your room and add some happiness to your environment. 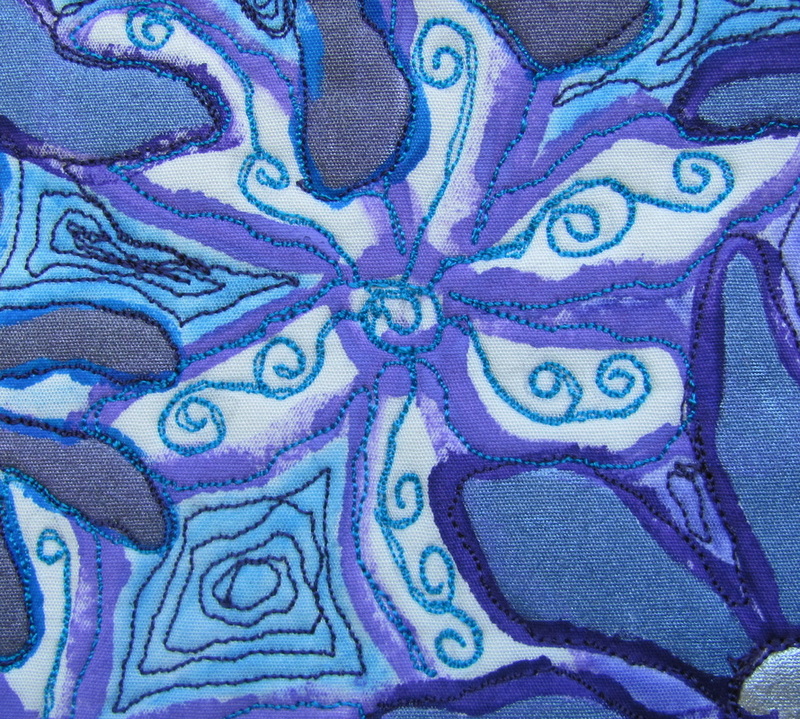 It is a wholecloth quilt. 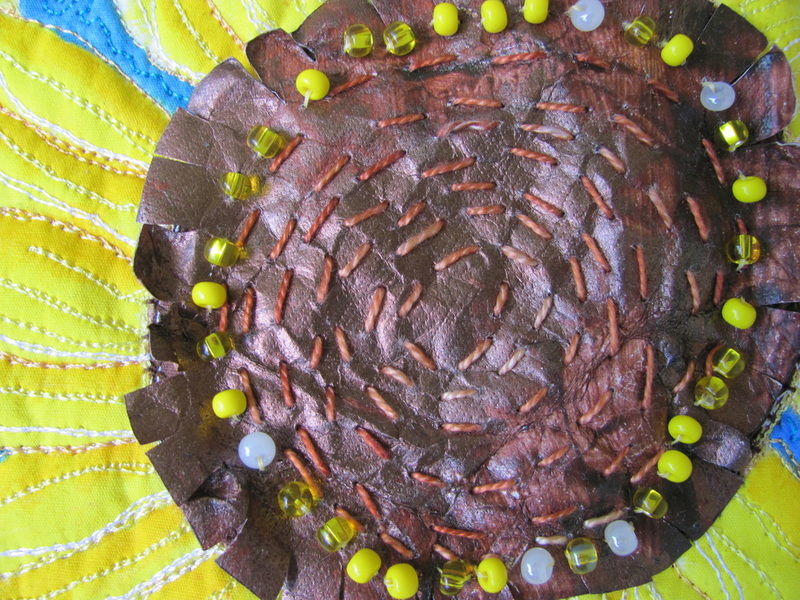 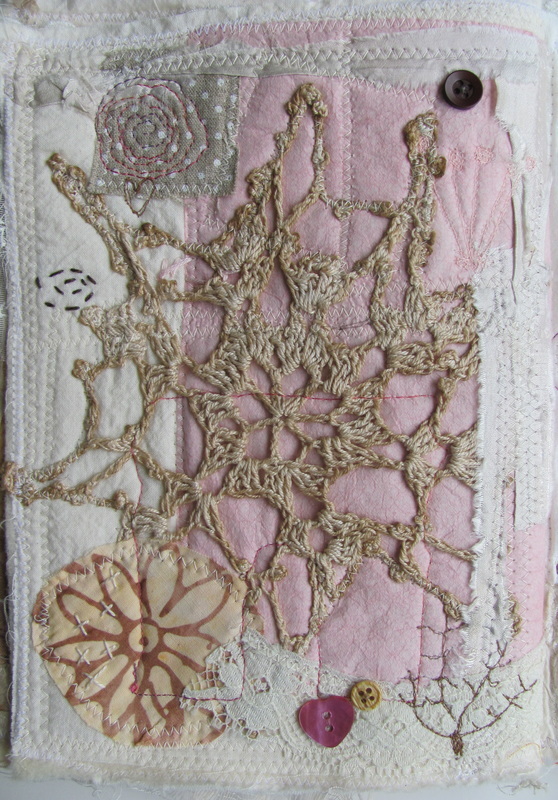 I painted it, then thread sketched, quilted, hand stitched the tyvek centers, and then added the beads. 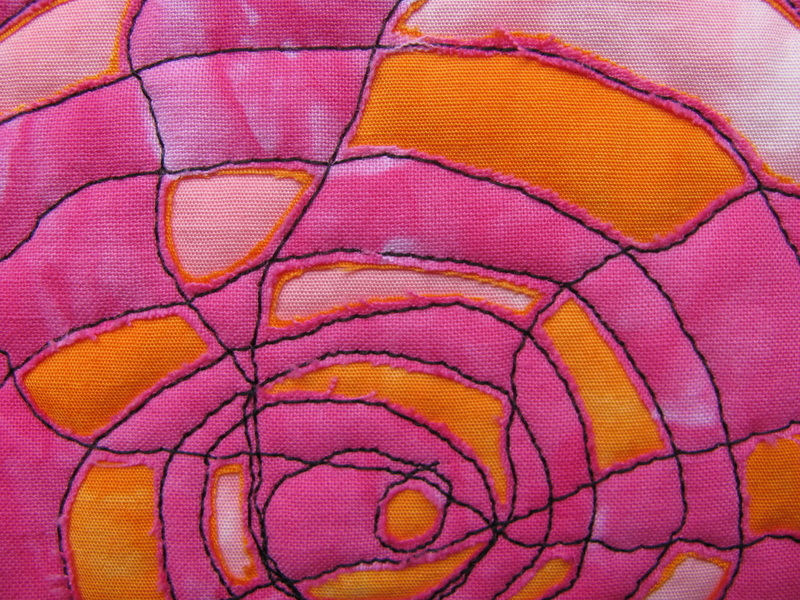 Joyful Summer is 16 1/2" x 16". 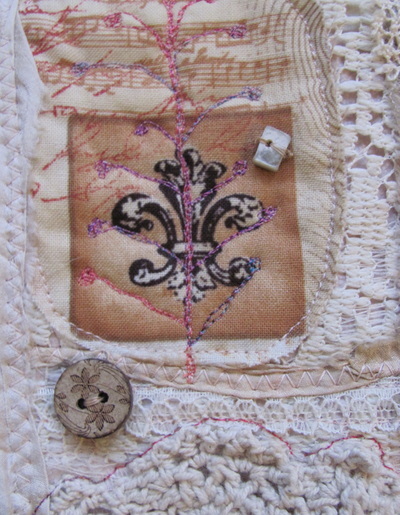 It is ready to hang from a dowel or rod by a hanging sleeve on the back. 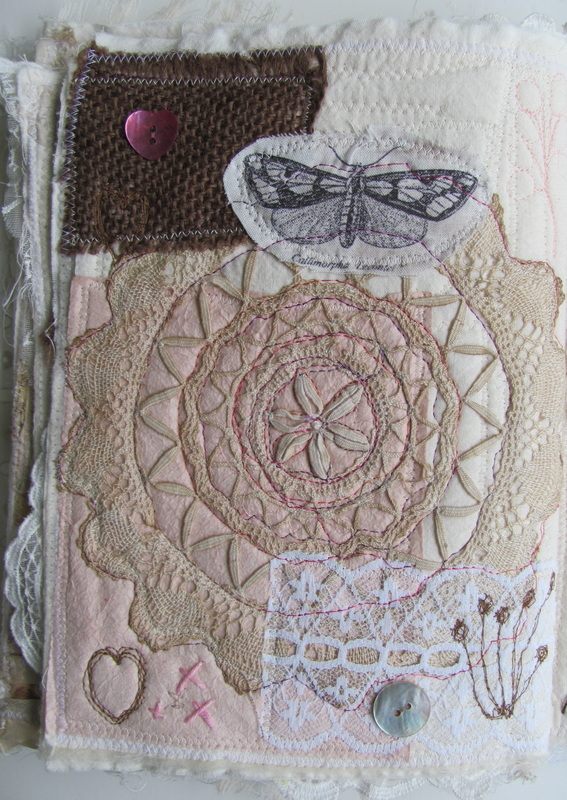 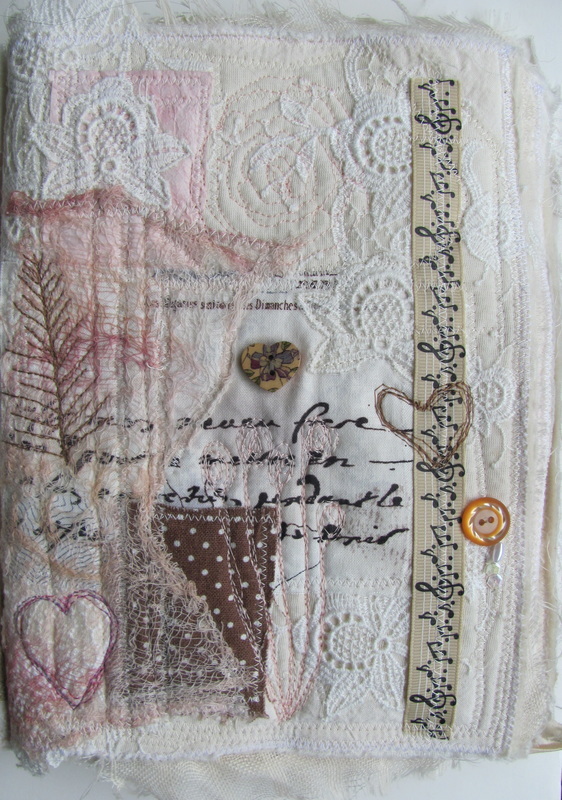 This quilted book is a labor of love. 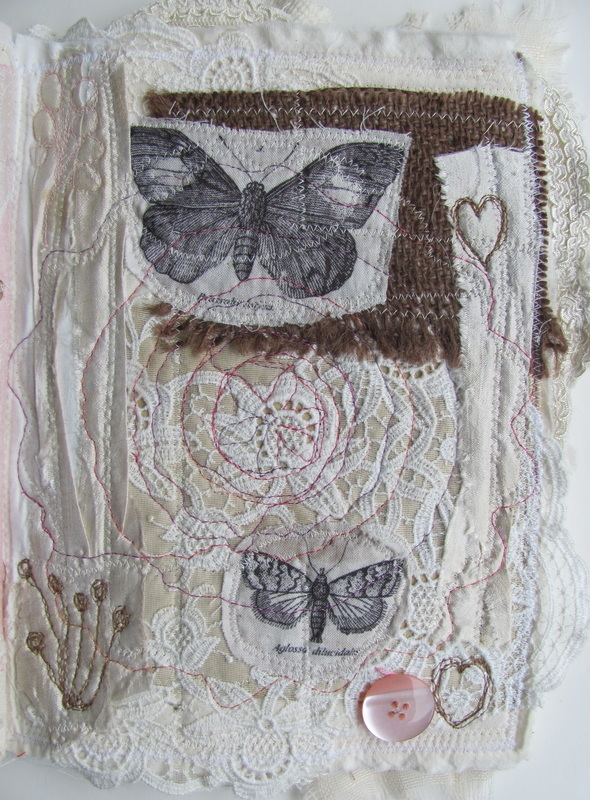 It is a vintage look book made from new fabric, recycled garments, recycled linens, burlap, dyed cheesecloth, lace, ribbon, vintage doilies, color catcher sheets, and recycled sari silk ribbon. 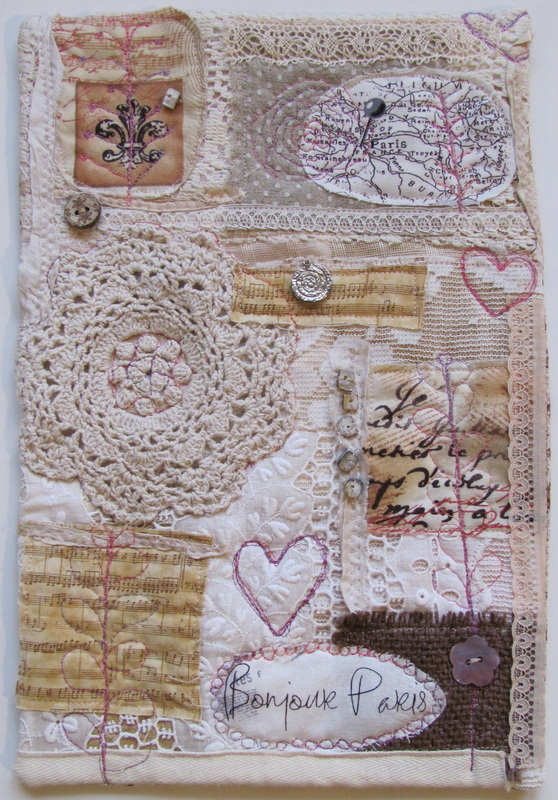 I free-motion stitched flowers, plants, and hearts. 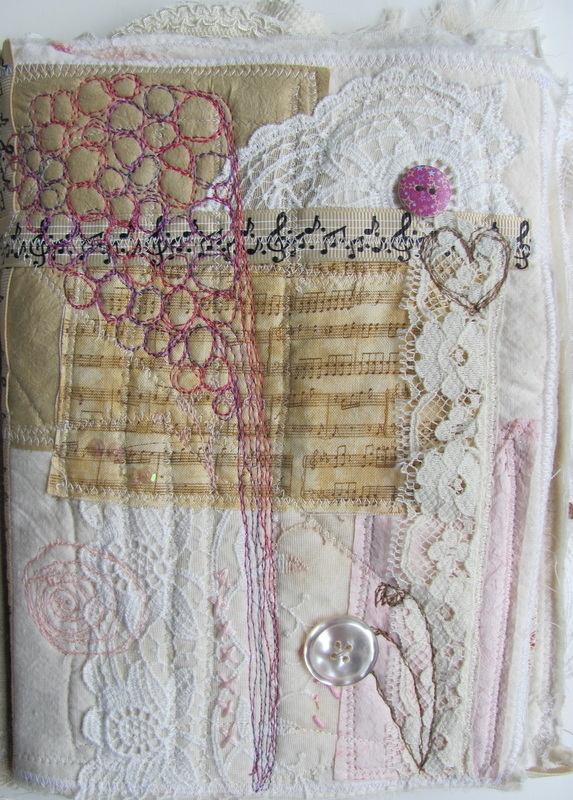 Then I added beads, buttons, charms, bits of vintage jewelry, and sequins. 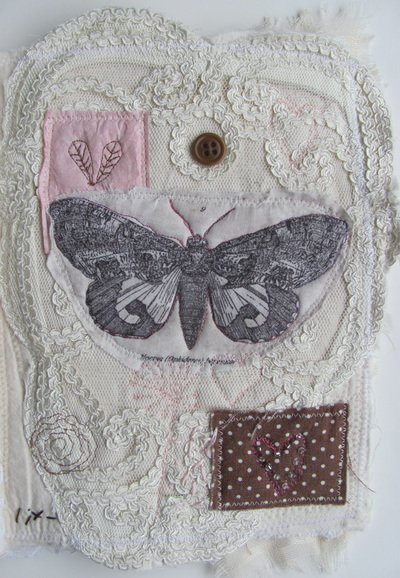 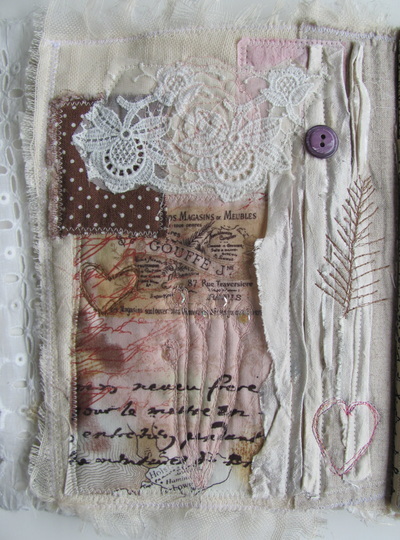 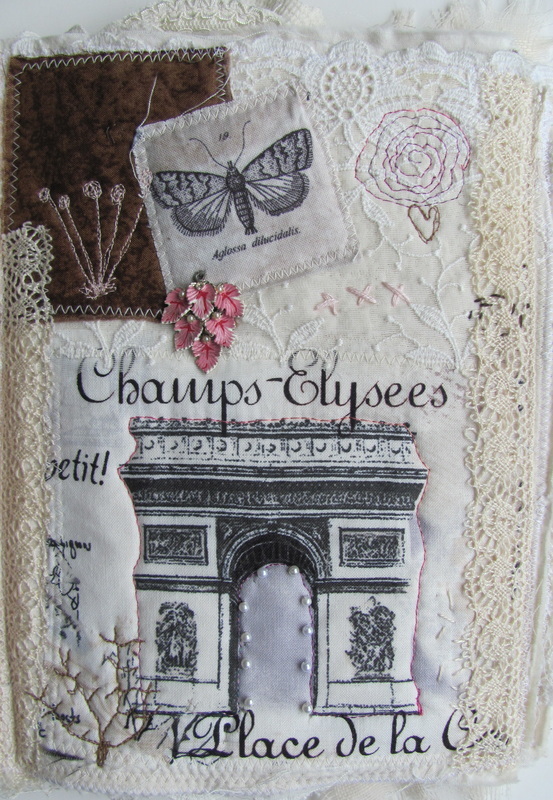 It has touches of Paris, steampunk, Victorian, and all kinds of hand stitching and sweet details. You can see the detail in the photos of each page below. 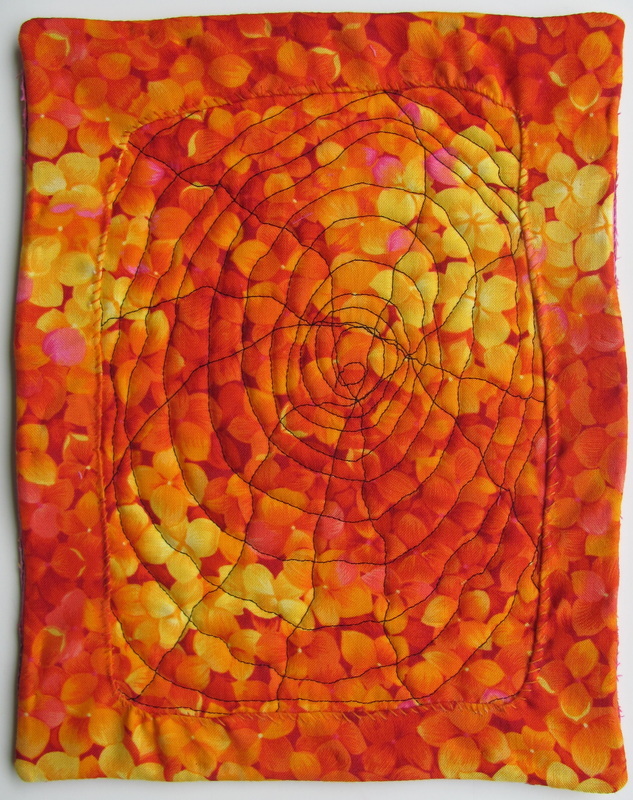 This art quilt is sure to add a pop of color to any space. It captures the feeling of the warmth of summer and a bright flower garden. 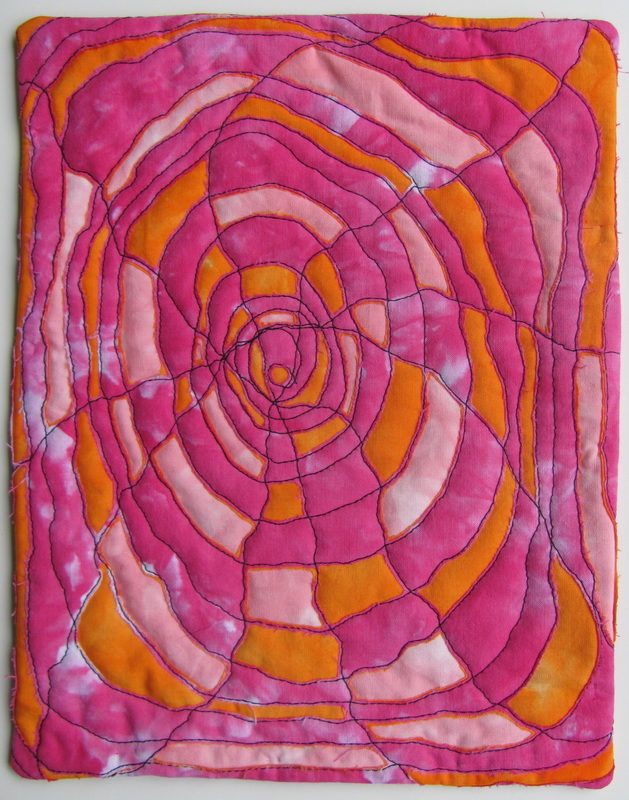 The swirling Vortex will carry you away from the everyday, ordinary and bring you a bright spot of joy. 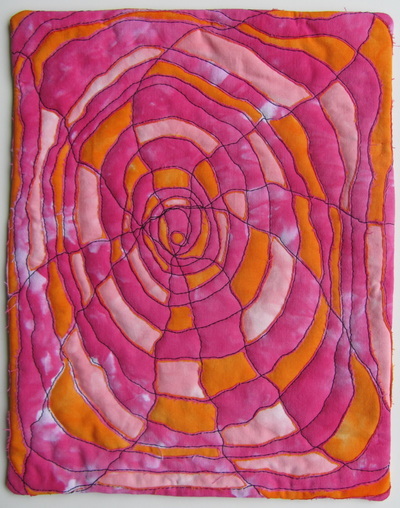 Vortex is 7 1/2" X 10". 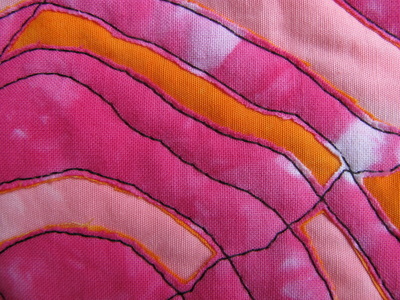 It is made from my hand dyed fabrics. 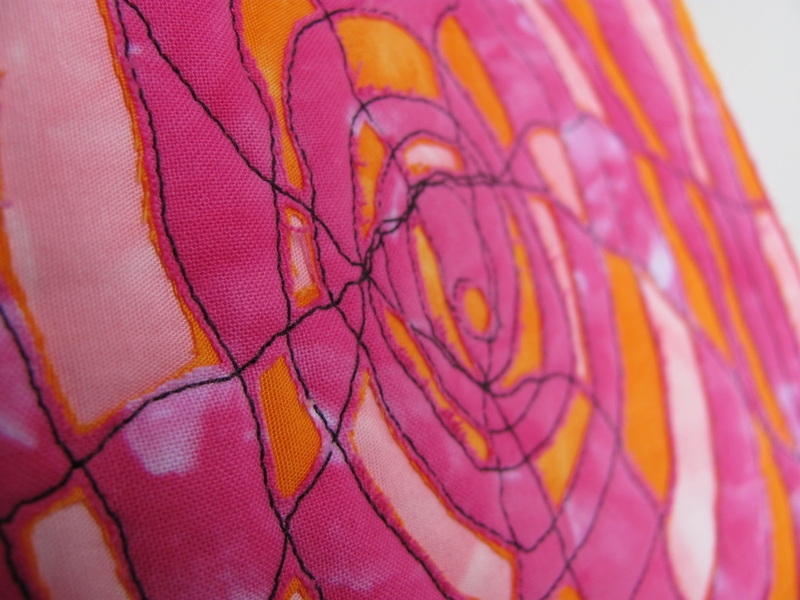 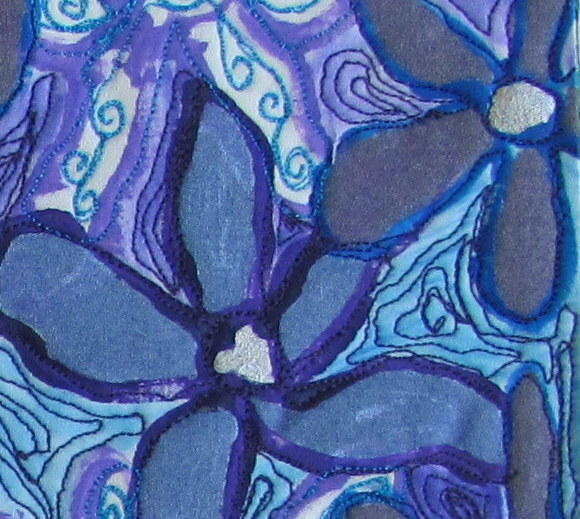 It has three layers that are quilted and then parts of the design are cut away to reveal the colors underneath. It is ready to hang from a thread chain. 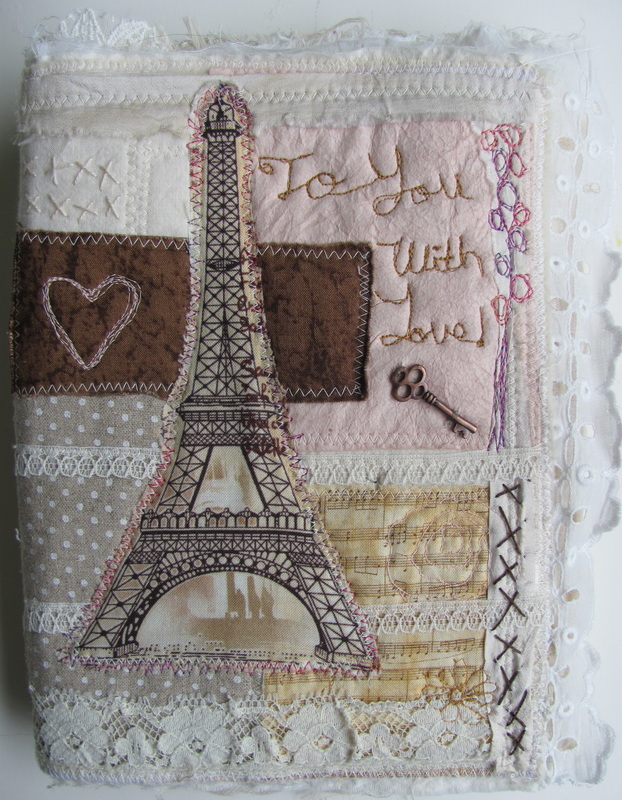 This art quilt is $55.00. 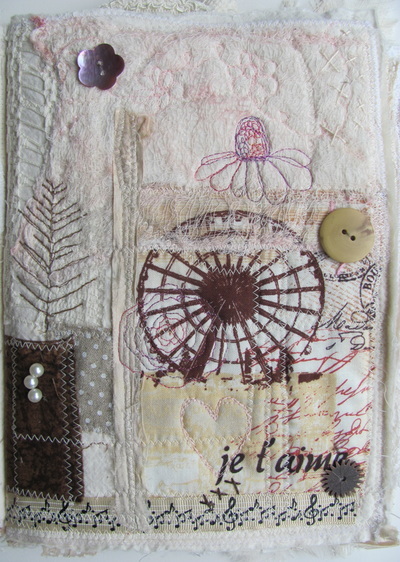 Bonjour is made from a mix of reclaimed and new textiles. 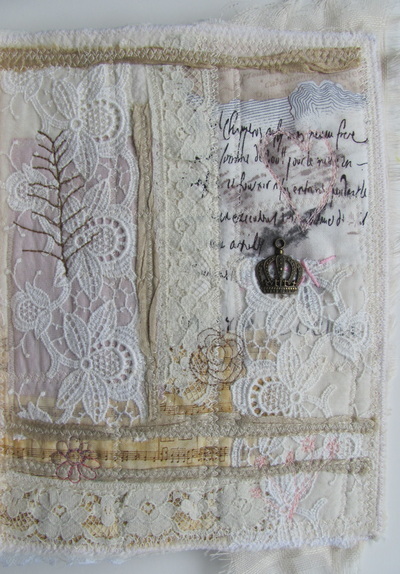 I used worn garments, old linens, vintage lace and doilies, along with new fabrics and silk sari ribbon that is reclaimed silk waste. 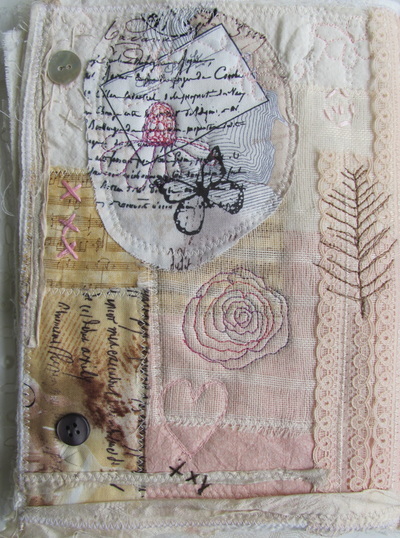 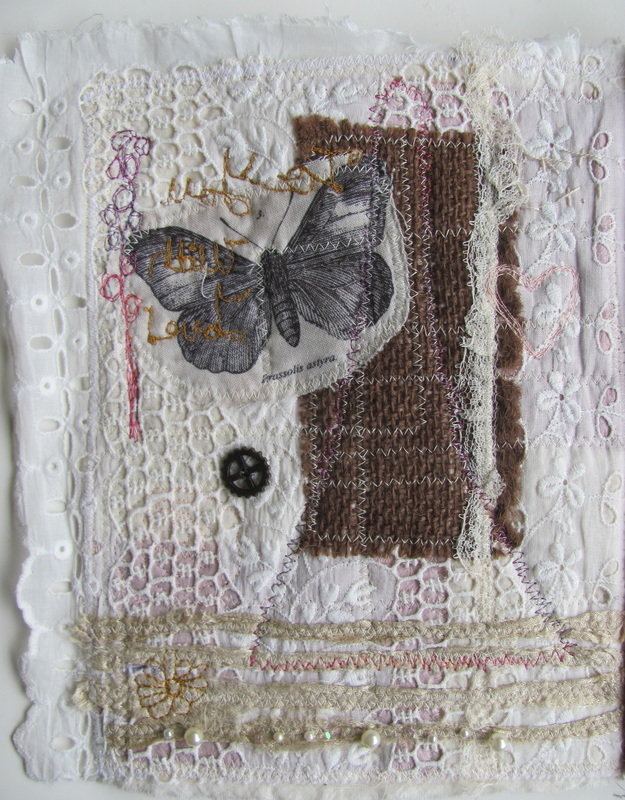 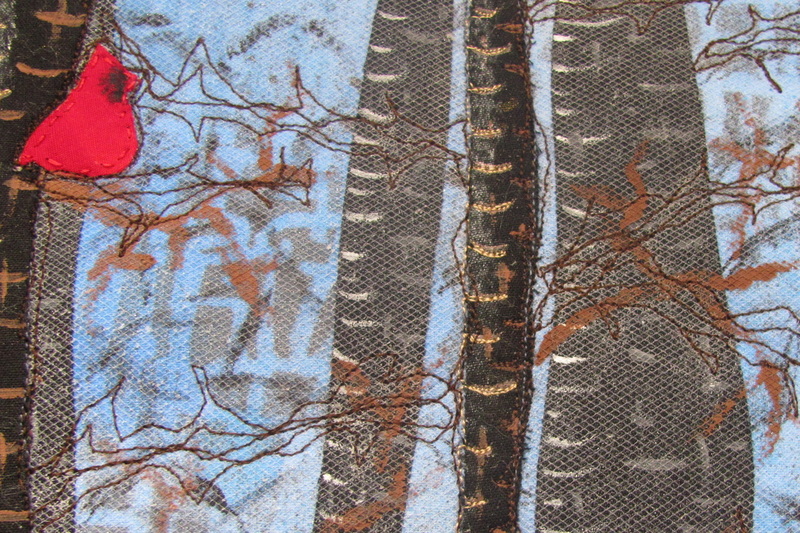 I love taking textiles that would be thrown away and instead giving them a new life in an art quilt. 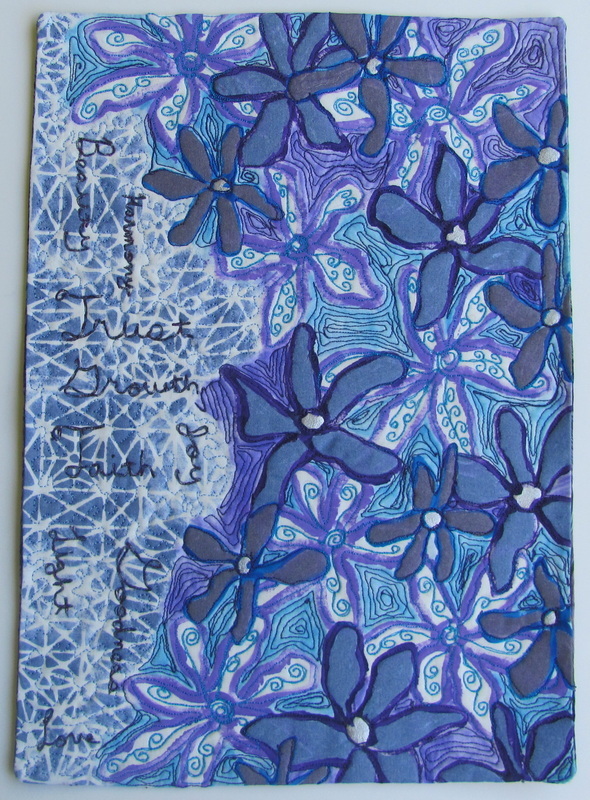 This piece is 8" x 12 1/2". It is ready to hang from a thread chain. 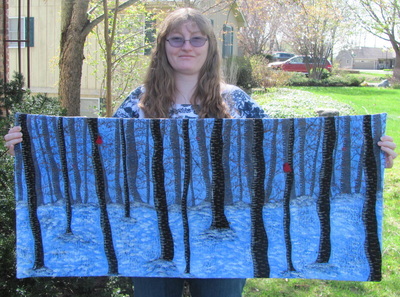 This art quilt is $65.00. 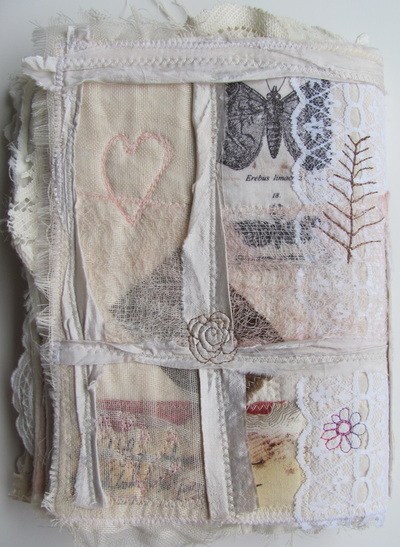 I also have kits available to make a similar art quilt. Find those here. 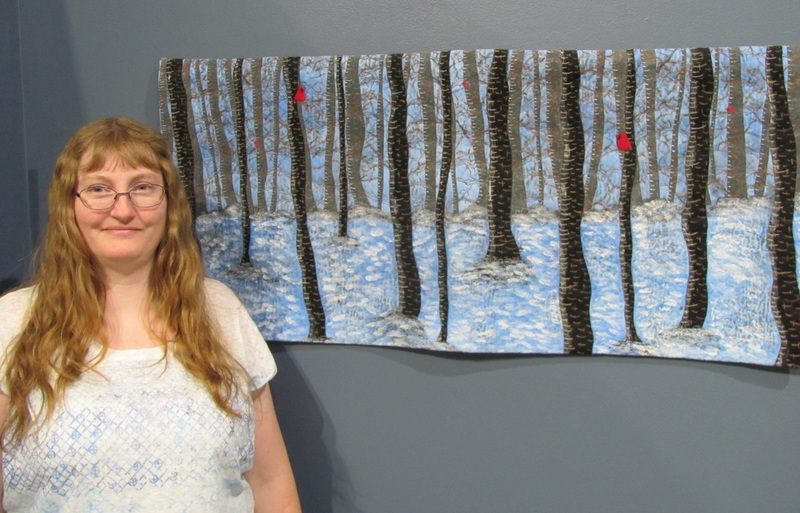 This quilt was inspired by views of the forest during the northern winters and the cardinals that I see outside of my window during the cold months. 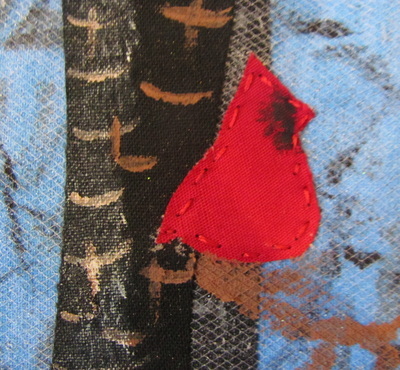 Even when everything is icy and cold there is great beauty in the forest. 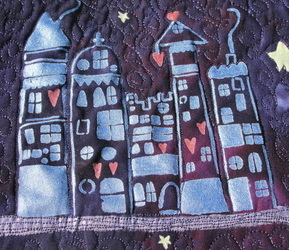 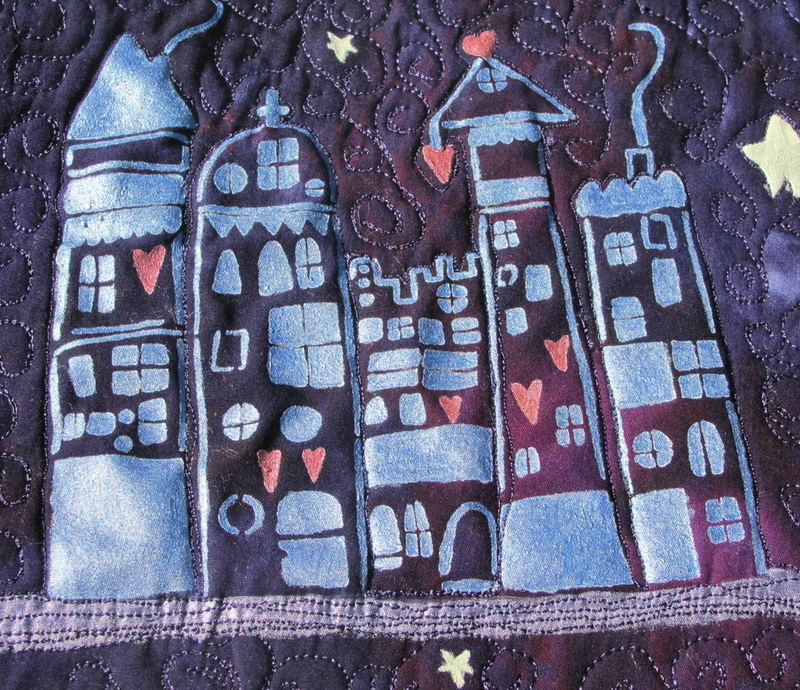 This quilt is hand painted and has layers of applique, painting and both machine and hand stitching. 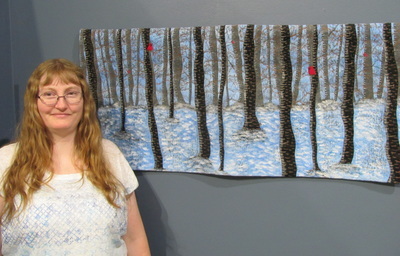 Winter Woods was accepted for the JCAA Biennial show and was displayed at the Hurst Gallery in the Ella Sharp Museum. 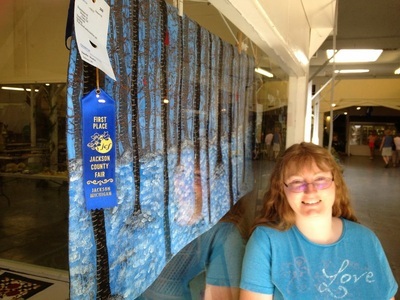 It also won first place in it's category at the Jackson County Fair. This wall hanging is 42" x 20" It is ready to hang from a dowel or rod by a hanging sleeve on the back. This art quilt is $190.00. This is an inspirational quilt. 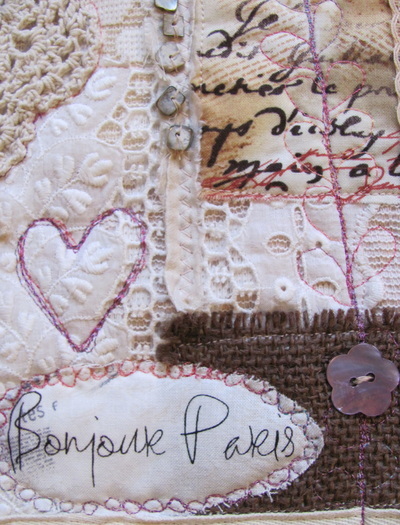 Uplifting words remind us of the good things in life. 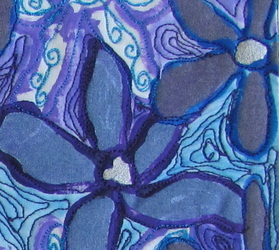 Let this beautiful flower piece inspire your life. This wall hanging is 9 1/2" X 13". 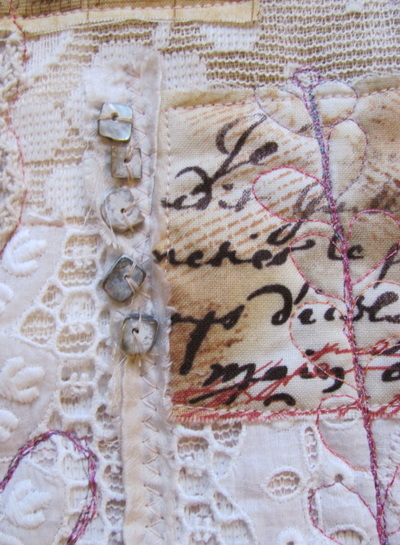 It is hand painted and then stitched. It is ready to hang from a thread chain on the back. 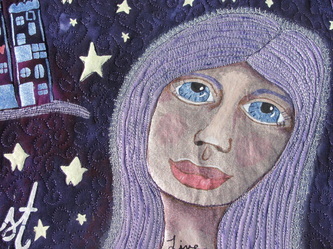 This art quilt is $70.00. 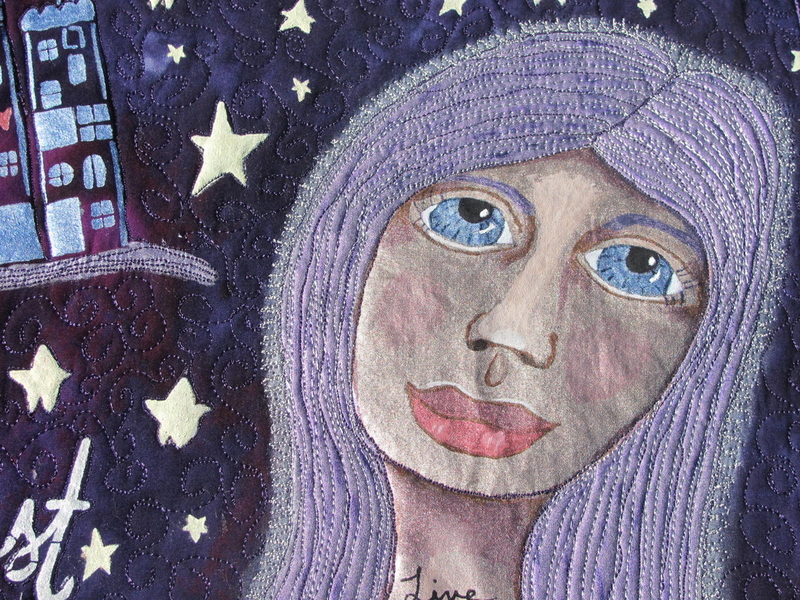 This quilt transports you back to childhood to explore the world of daydreams. 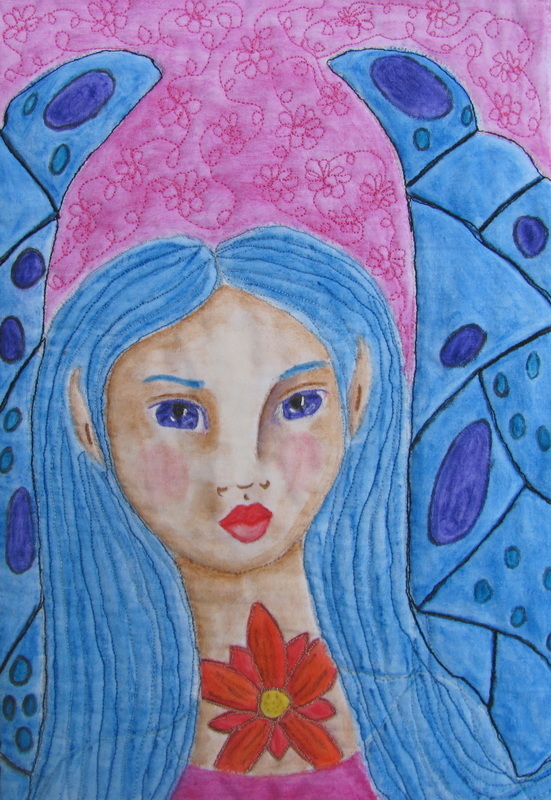 The girl is dreaming about who she could be. 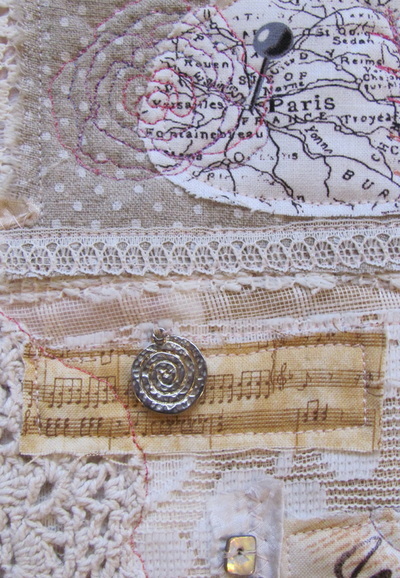 Where will you allow your dreams to take you? 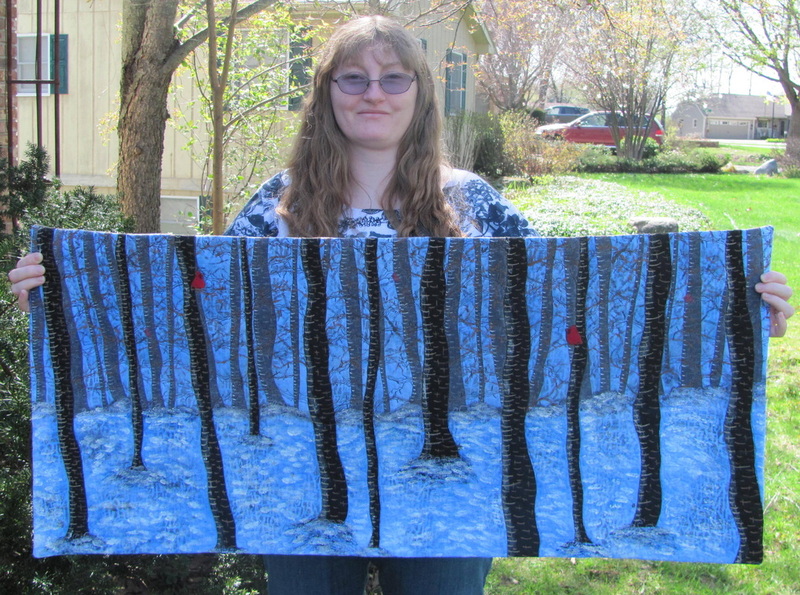 This quilt is 15” X 33”. 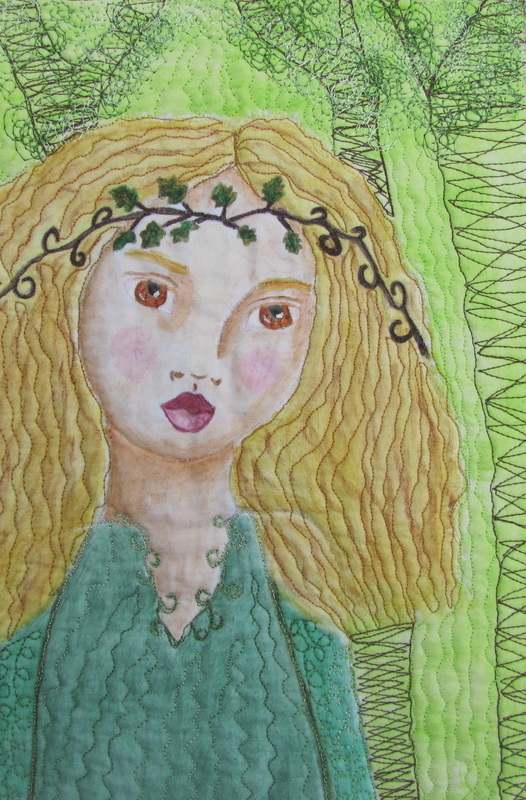 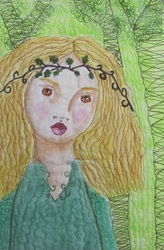 It is a whole cloth cotton quilt that was painted by me with Derwent Inktense blocks and pencils and textile medium. After the first layer of painting was done it was heavily quilted to bring out the details. Then it was painted with metallic paint to add accents to certain parts. 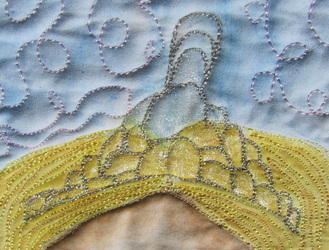 The edges are finished with a satin stitch. 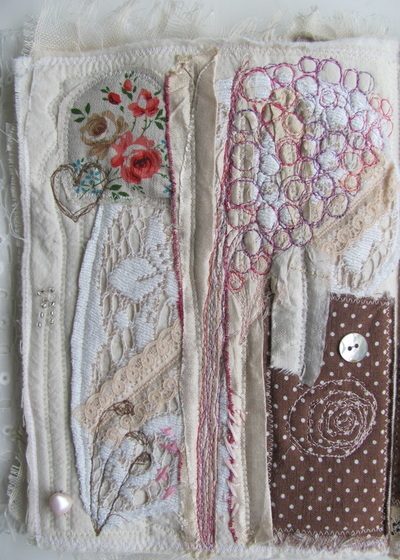 It is ready to hang from a dowel or rod by a hanging sleeve on the back. 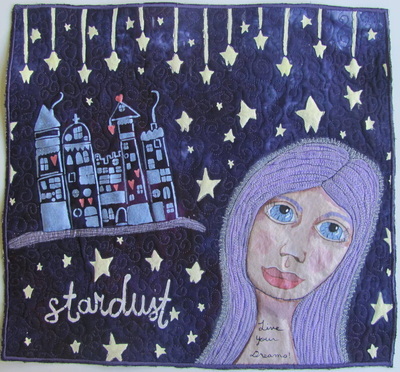 This girl has a glow around her head and the word stardust to remind you to add some stardust to your life. 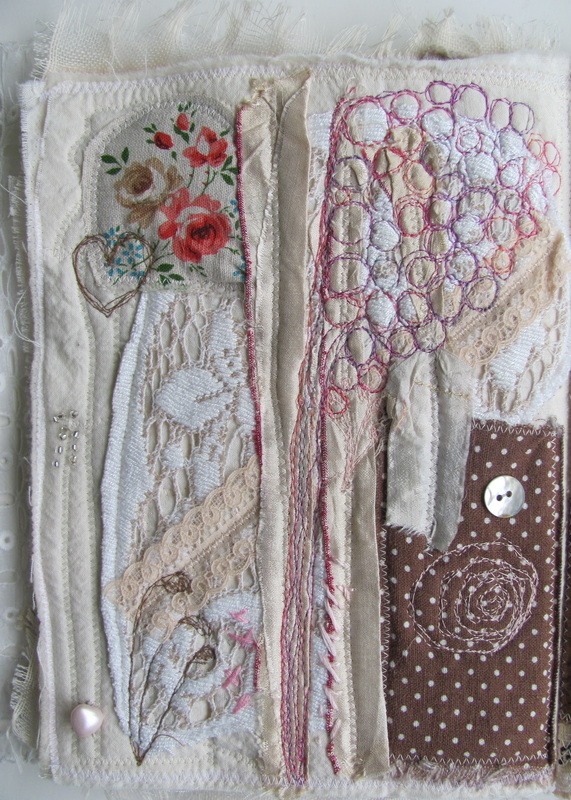 This is a whimsical quilted wall hanging. 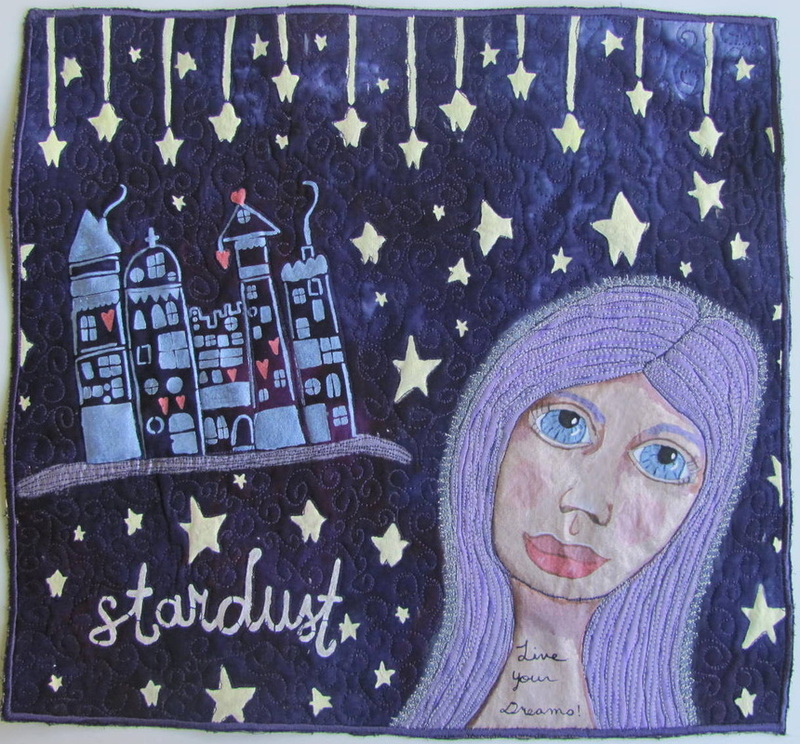 It is painted with high quality metallic fabric paints and certain areas are high-lighted with Pearl-Ex powders as well to add exceptional shimmer to the quilt. 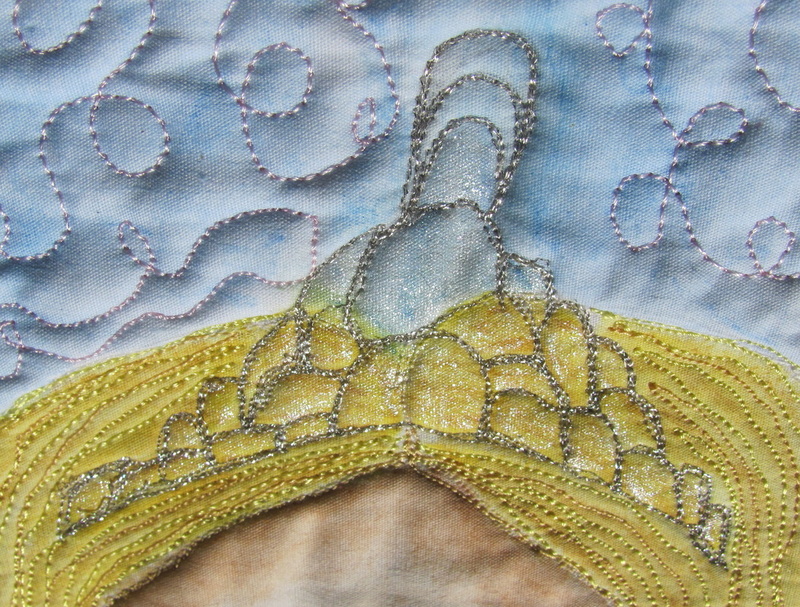 The edges are finished with a satin stitch. 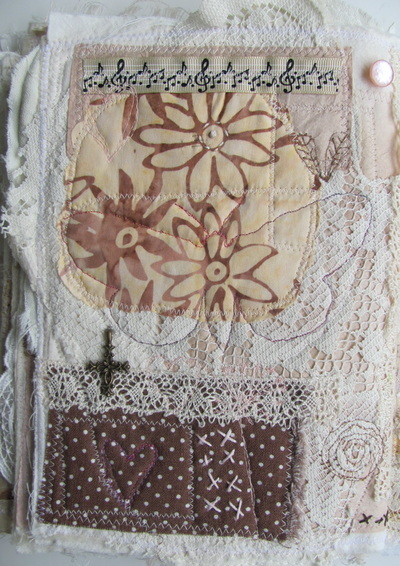 It is ready to hang from a dowel or rod by a hanging sleeve on the back. 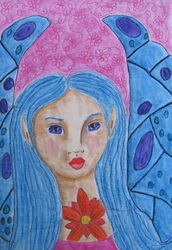 It is 15” x 14”.